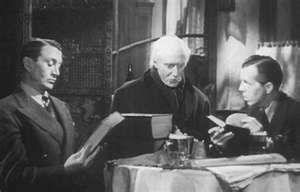 Roy William Neill’s Sherlock Holmes & the Secret Weapon, released in 1943, is short at just under 70 minutes. 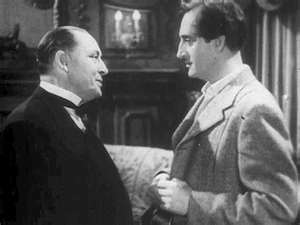 It’s the 4th of the 14 Sherlock Holmes movies starring Basil Rathbone as Holmes and Nigel Bruce as the bubbling Dr. Watson, 11 of which Neill directed. Bruce’s portrayal of Watson, while making Holmes look all the more brilliant, is in stark contrast to the Arthur Conan Doyle character – a learned student of Holmes’ techniques. The pair are by far the most prolific Holmes & Watson on film, and neither ever played the part with another actor in the opposite role. 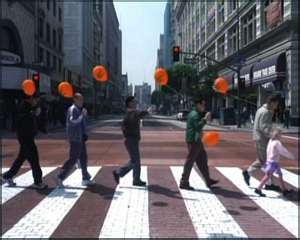 The plot of the film is based loosely on Doyle’s short story The Adventure of the Dancing Men, listed in the credits as simply The Dancing Men. It’s brought forward to the current events of the time by incorporating a Nazi plan to steal the code for “The Secret Weapon” – an improved bomb-sight, a device used to increase bombing accuracy, invented by Dr. Torbel (William Post Jr.). The genius behind the plan is Professor Moriarty, played by Lionel Atwill nicely in his small role, his only as Sherlock’s archenemy. Moriarty intends to steal the code & sell it to the Nazi’s for a huge sum, selling his native England down the Thames River along the way! And if Holmes stands in his way, he’ll have no choice but to kill him. Of course, Moriarty never does kill Holmes, though he tries to in virtually every Sherlock story every portrayed in prose or film. 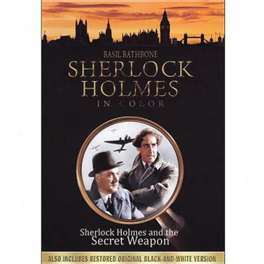 In this film, he’s rescued from demise by Watson & Scotland Yard’s Inspector Lestrade. Neill makes one major flaw in The Secret Weapon: Sherlock Holmes, the most brilliant criminologist in Great Britain, doesn’t know how to make noise with his hands or feet when they’re bound, nor how to make guttural noises while gagged. The music in Secret Weapon is tremendous – composed by Frank Skinner, a five time Oscar nominee, with one nomination for Best Score in every year between 1939 & 1944 except ’40. 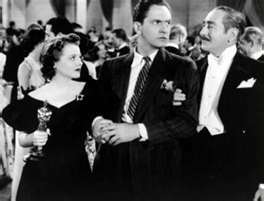 While Nigel Bruce was never nominated for an Academy Award, Basil Rathbone was nominated for Best Supporting Actor Oscars twice: In 1937 as Tybalt in Romeo & Juliet; and two years later as Louis XI in If I Were King, losing both times to Walter Brennan. There’s a Shakespearean thread that ties Sherlock Holmes & the Secret Weapon together from beginning to end. It seems likely that this influence was of Rathbone’s design. Before he made movies, and well prior to his role as Tybalt, he was a renowned Shakespearean stage actor in England & America. The first scene of Secret Weapon takes place in a pub where a man is trying to sell books by The Bard; and the final line is a condensed version of a passage from Richard II. Arthur Conan Doyle first introduced the character Sherlock Holmes to the world 125 years ago. He is the most portrayed character in film, real or fictional, first appearing in 1900. Last year, Robert Downey Jr. and Jude Law played Holmes & Watson respectively in Sherlock Holmes – A Game of Shadows; and a Spanish film, Holmes – Madrid Suite 1890 is in post-production, scheduled for release later this year. If there’s an ounce of truth to the cliché “Great art stands the test of time”, the enduring character Sherlock Holmes – who even today prefers to use brain over brawn [How refreshing is that???] – certainly passed that violin examination with flying colors years ago! The trailer for this good movie is below. And if you want to watch it the entire movie, go to http://www.youtube.com/watch?v=FOyKEZUyiDc. Jessie Nelson’s I Am Sam is probably the greatest motion picture to never win an Academy Award. 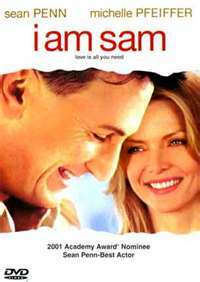 In fact, it was only nominated for one Oscar at the 74th Academy Awards in 2002: Sean Penn for Best Actor as Sam Dawson. In one of the worst decisions ever made by the Academy, he lost to Denzel Washington as Detective Alonzo Harris in Training Day. Training Day is an okay film, but each of the other four nominees (Penn, Russell Crowe as John Nash in A Beautiful Mind, Will Smith as/in Ali, and Tom Wilkinson as Matt Fowler in In the Bedroom) are far more deserving of the Award. And Sean Penn’s performance is an all-timer: He depicts Sam as poignant & funny, loving while taken advantage of, intellectually disabled & wise, supplicating & helpful; and a great, great father! If I could be as good at anything as Sam is a Dad – let alone something as difficult as parenting – my life would be enriched. Though Penn won two Best Actor Oscars, at the 76th & 81st Academy Awards for Mystic River and Milk respectively, this is far & away his greatest performance. This was Jessie Nelson’s second and, sadly, seemingly final directorial project. She continued to write & produce movies through 2007 and is the co-executive producer of Hope Springs slated for release on August 10. It seems a waste that she’s now in charge of overseeing the financial aspects of & securing funding for films when she made, had it not been for Crash, the best movie of the previous decade. She brought out the best not only of Penn, but a plethora of other actors in the film: 3-time Oscar nominee Michelle Pfeiffer plays Sam’s pro bono attorney, Rita Harrison; Dakota Fanning in her finest role as 7 year old Lucy was just 6 during filming; 2-time Oscar winner Dianne Wiest is the brilliant musician and agoraphobic Beatles aficionado, Annie; Oscar nominee Laura Dern is heart-wrenching in her brief role as Lucy’s foster mother, Randy; Loretta Devine, who three years later would portray Shaniqua in Crash, is the irritating, “by the book” Children’s Social Services worker, Margaret Calgrove; and Richard Schiff, the heartless State’s Attorney hell-bent on removing Lucy from Sam’s custody. Sam, whose IQ is only 70, is raising Lucy alone after her mother abandons her to him when she is just leaving the hospital. Lucy is “in some ways” fast becoming Sam’s intellectual superior and, as a result, the film’s title is derived from their favorite book to read together, Green Eggs and Ham. Sam struggles to learn and care for her, but he has a great support system of his intellectually disabled friends, Annie, and later Rita. He is a devote Beatles fanatic, due in large part to the encouragement of his mentor, Annie. His teachings to Lucy are often metaphors of Beatles lyrics, and Lucy Diamond Dawson was, of course, named after the song. When he meets his attorney, [Lovely] Rita [George] Harrison, he believes without voicing as much, that her name can only mean it was fate. Beatles’ songs (due to legal complications & to the chagrin of Penn) covered wonderfully by a variety of established artists and Hans Zimmer’s fine score permeate this immense film. But it’s the chemistry between Sean Penn and Michelle Pfeiffer & Dianne Wiest & Laura Dern & especially Dakota Fanning that makes I Am Sam so uplifting & joyous that it’s draining. After watching it, you’ll need to go to the movies just so that you can relax! 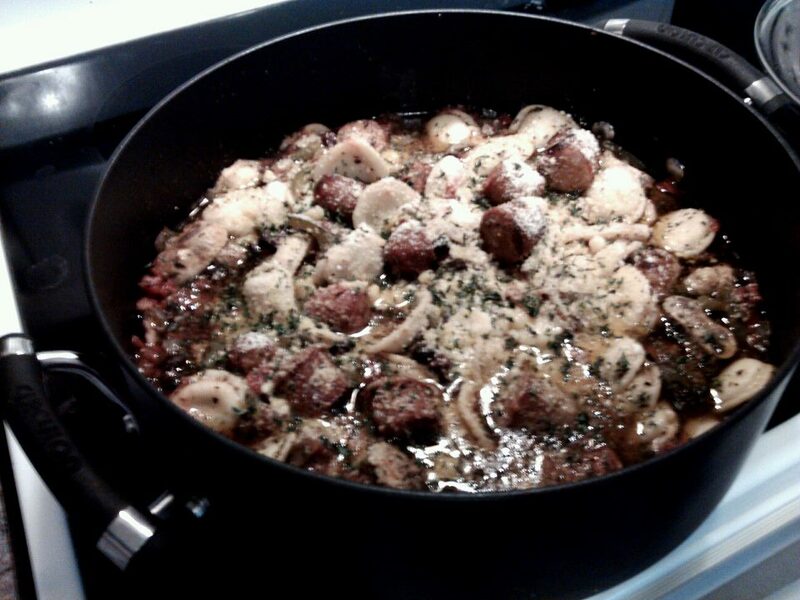  Cover & move to preheated 325º oven for 20 min. Scott Cooper’s Crazy Heart earned Jeff Bridges his first Best Actor Oscar at the 82nd Academy Awards in 2010 for his characterization of Bad Blake – a broken down, alcoholic, has-been, old-school country singer trying to eke out a living playing honky-tonks with local bands backing him up for mostly late middle-aged fans. It was his fifth Acting nomination, second for Best Actor (Starman). The following year, he received his third best Actor Nomination for his brilliant portrayal of Rooster Cogburn in the remake of True Grit. He’s one of the best actors of his generation. 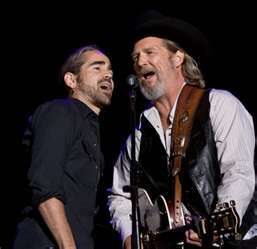 Crazy Heart also won for Best Song – The Weary Kind by Ryan Bingham & T Bone Burnett. In the film, the piece is penned by Bad & sold to Tommy (Colin Farrell, who is fantastic as Bad’s protégé). Tommy is the real McCoy but also symbolizes new country. He’s rich & very famous, and Bad unjustifiably resents this some since Tommy always has Bad’s best interest in mind. Bad believes that writing songs & opening for other artists is selling out, but he agrees to do so for Tommy even though The Weary Kind is one of his best songs: He needs the money! Both actors do all of their own singing in the film. Bad’s love interest is the much younger reporter, Jean Craddock, played by Maggie Gyllenhaal. Her performance earned her a Best Supporting Actress Oscar Nomination. She has a 4-year-old boy, Buddy: Jack Nation is marvelous in his first role. Bad loves Jean & Buddy – they help him grow & teach him about family. 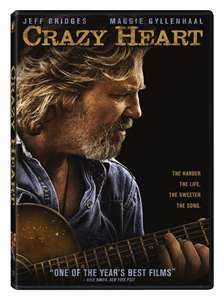 A couple of additional firsts in this great motion picture: Crazy Heart was first & only directorial venture for Scott Cooper (his second movie, Out of the Furnace, is filming now & scheduled for release next year), who also adapted the screenplay from Thomas Cobb’s 1987 novel; and Ryan Bingham made his acting debut as Tony of Tony & the Renegades, Bad’s backup band for the impending gig at the bar in a bowling alley as the movie opens. The band is Ryan’s actual band at the time, Ryan Bingham & the Dead Horses. Robert Duvall, who coincidentally won his only Best Actor Oscar in 1983 at the 56th Academy Awards as aging country singer Mac Sledge, has a small role as Wayne, Bad’s longtime friend. He helps him in his struggle with alcoholism & we’re left with the impression that he’s been trying to do so for a long time. Bad’s drink of choice is the fictitious McClure’s Kentucky Bourbon. Early in the film, liquor store owner Bill Wilson gives Bad a bottle of it in hopes that he’ll sing one of his hits, I Don’t Know, and dedicate it to his wife Beverly at the show at the bowling alley later that night. The character is so-named in a crafty & cunning homage to Alcoholics Anonymous co-founder Bill W[ilson]. William A. Wellman & uncredited co-director Jack Conway’s A Star Is Born is the original version of a story of the making of a Hollywood star. It’s been remade twice: For Judy Garland & Barbra Streisand. And Clint Eastwood has another version in the works scheduled for release next year starring Beyonce. 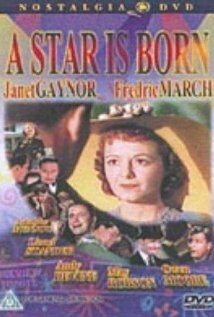 A Star Is Born received 7 Oscar Nominations at the 10th Academy Awards in 1938 including Best Actor (Fredric March as Norman Maine), Actress (Janet Gaynor as Esther Blodgett/Vicki Lester), Director, Screenplay, and Picture – the very first all-color film nominated in that category. And it earned two Academy Awards: W. Howard Greene received an Honorary Plaque for Color Photography; and Wellman & Robert Carson won the Oscar for Best Original Story. Gaynor won the first Best Actress Oscar in ‘29 for her roles in 3 movies: 7th Heaven; Street Angel; and Sunrise. That actual Oscar is used in the pivotal Academy Awards scene in this film. Frederic March, a five-time Best Actor Nominee, took home Oscars for Dr. Jekyll & Mr. Hyde at 5th Oscars in ’32 and The Best Years of Our Lives at the 19th Academy Awards in 1947. There are many fine supporting performances in the piece as well: Adolphe Menjou, who won the Best Actor Oscar in ’31 for The Front Page. is great as producer Oliver Niles. 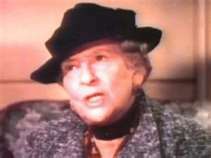 Clara Blandick, Auntie Em, plays Esther’s Aunt Mattie in an uncredited cameo role – demonstrating her versatility: Aunt Mattie is nothing like Auntie Em. Amazingly, Clara was never nominated for an Oscar. May Robson, glorious in her small role as Grandmother Lettie, was nominated for Best Actress in ’34 for Lady for a Day at 6th Academy Awards. And Lionel Stander is stunning in his portrayal of the film’s antagonist, publicist Matt Libby. The film opens with Esther returning from a movie – she goes all the time. She dreams of being a movie star but mean Aunt Mattie belittles her. Grandmother Lettie, however, is encouraging & supportive. Esther moves to Hollywood but finds no opportunity there until she befriends Danny McGuire, a Second Director played by Andy Devine. Devine is best known for his role as frightened Marshall Appleyard in The Man Who Shot Liberty Valance. One night, the two of them go to a classical concert at the Hollywood Bowl where she witnesses one of her idols, leading man Norman Maine, at his worst. A drunken Maine loses his temper & gets violent with an overzealous photographer. Maine is developing a reputation as a temperamental drunk. He’s not unlike some modern stars – abusing the paparazzi, often deservedly, and with a penchant for binge partying. Shortly thereafter, Danny gets Esther a gig as a waitress at a party his director is throwing for the Hollywood elite in hopes of her turning heads. There she meets & impresses Maine by telling him how much he disappointed her at the Bowl. A Star Is Born is a story of love, following one’s dreams, the measurements of success, rags to riches & riches to rags, the high price of fame, alcoholism, and the making & breaking of stars. How different is Vicki Lester from Emma Stone? Or Norman Maine from Charlie Sheen? A Star Is Born is every bit as vibrant today as it was when it was released 75 years ago because great art transcends time! Robert Zemeckis’ Forrest Gump stands tall as one of the finest works in metaphorical celluloid in the short history of the art form. When it came out in the summer of ’94, it made a huge splash. In the fall that year, The Shawshank Redemption, another fine film was released. 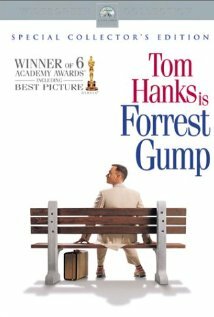 At the 67th Academy Awards, Gump was nominated for 13 & won 6 Oscars, including 4 of the Big 7 to which it applied (Zemeckis, Tom Hanks as Forrest, Picture, and Eric Roth’s Adapted Screenplay). Shawshank was nominated for 7 Oscars including Best Picture, Actor (Morgan Freeman) and Adapted Screenplay, but won none. The immediate reaction from the realists was a unified outcry of disdain. Amongst them was my oldest brother. But rather than ask if Julie Andrews deserved her Best Actress Award for Mary Poppins, I decided to let greatness be measured over time. And while both films have passed that ultimate test, the voices of outrage have been squelched and Gump got its redemption. 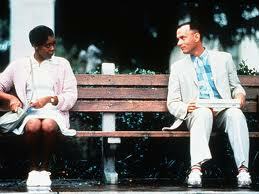 Forrest Gump marks Zemeckis’ only Oscar recognition as a director. He was also nominated for Original Screenplay for Back to the Future in ’86. 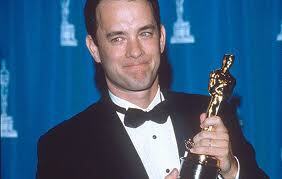 Hanks’ Best Actor Oscar as Forrest was his second successive, having won the year before for Philadelphia. The film is Forrest’s narrative tale of his life as he sits awaiting a bus in Savannah to take him to see the love of his life – his Jenny, Robin Wright’s best performance amongst many fine roles including Moll Flanders two years later. Forrest is forever seeking & protecting his Jenny in what can only be described Beatrician devotion, but every time they’re together for any length of time, “just like that, she[’s] gone”. Forrest is intellectually disabled & ubiquitous: His life is a charmed series of significant second half of the 20th century events – and this quality is what caused the outcries against it. Through incredible luck & skill: He becomes an All-American under Coach Bear Bryant; reports the Watergate break-in; meets two Presidents; volunteers for the Army & gets sent to Vietnam where he wins the Congressional Medal of Honor; plays for the U.S. Ping Pong Team in China; ushers in the 80’s running craze; becomes a “gazillionaire”; and so on. While in ‘Nam, he meets his two best friends – Bubba and Lieutenant Dan. Mykelti Williamson is great in his small but important role as Bubba. Gary Sinise was nominated for his only Oscar as Lieutenant Dan but unfortunately lost to Martin Landau as Bela Lugosi in Ed Wood. The last important character in the cast is Forrest’s loving & protective Mama, played by two-time Best Actress Oscar Winner, Sally Field (Norma Rae and Places in the Heart in ’80 & ’85 respectively). She makes sure that Forrest is treated no differently than anyone else and teaches him everything he needs to know in ways that he can understand.